Hotspot Shield secures your connection to your home network and public Internet networks. It uses HTTPS encryption to protect your personal data, web sessions and other confidential information (credit card number, passwords, etc.) when shopping online. This software also gives you the ability to hide your IP address for your online computer in order to browse the Web anonymously. Available on Mac and PC, Hotspot Shield protects you from snoopers on Wi-Fi hotspots. It provides unlimited bandwidth and works over wired and Wi-Fi connections. Another advantage of this software is the creation of a virtual private network (VPN) between your laptop or iPhone and the Internet gateway in question, preventing anyone from accessing your activity history and tracking you. With 100 million downloads, this VPN service is one of the most reliable on the market. It offers a wide range of tools to users to browse the Net in a completely anonymous way and to protect their confidential data. 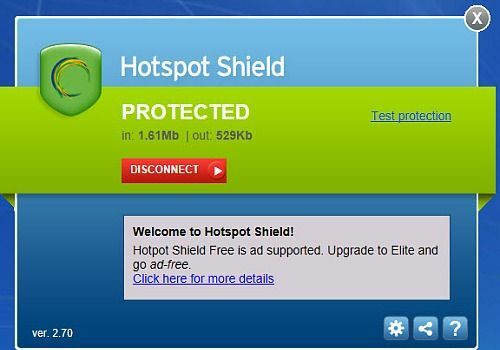 Hotspot is available in free version but also in Elite version with some additional features. The security solutions provider Emsisoft offers a package of decryption tools for about thirty ransomwares. OpenPuff is a very useful software if you want to protect one file by hiding it in another. It therefore makes it possible to hide a document and even proposes to add a password to make the file even more secure. A free tool developed by Bitdfender to allow you to recover files encrypted by the GandCrab ransomware.